Sunrise Movers – When choosing a moving company, it is important to make sure they are experienced. Discount South Florida Movers has been helping people in Florida for over a dozen years. Our team of professionals will set your mind at ease by treating you and your belongings with the utmost respect. Our mission is to provide you with a hassle free experience no matter what your moving needs are. Whatever services you need for your move, we can help. We can move your piano, artwork, antiques, or other fragile valuables. Distance is no factor either. We can move your items down the street or have them shipped long distance. Let us help you with your residential or commercial move. Contact us for a free quote and see how great our rates are! Sunrise is a city on the western edge of Broward County. The 88,000 residents of the city live within its 18 square miles. The city was incorporated in 1961 and subsequently developed by Norman Johnson. Over the years the city has gained some notoriety by occasionally getting “lost” by Google Maps with viewers being directed to Sarasota instead. No one knows why that is. CIGNA Healthcare runs of one their large operations centers in the there. The NHL’s Florida Panthers play out of the BB&T Center. The city also maintains its own system of parks and recreation centers with soccer fields, a gold course, tennis courts, and playgrounds. In addition, the city also operates its own utilities and fire and police. 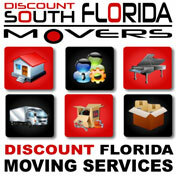 Discount South Florida and Sunrise movers provide low rates on residential, commercial, piano and long distance moving.